The Schliersee, on the edge of the Bavarian Alps, is in every way as attractive as its better-known neighbour, the Tegernsee. The beauty and variety of the area can best be seen from the surrounding summits, the Kirchbichl or the Schliersbergalm. The little lake island of Wörth is accessible to the public and has belonged to the state of Bavaria since 1971. Among the points of interest in Schliersee, a climatic health resort, is the St Sixtus church with a Holy Trinity group by Erasmus Grasser and wall and ceiling frescoes by Johann Baptist Zimmermann. The excellent quality of the water in the Schliersee is due in large part to the construction of a system for purifying waste water from the area surrounding the lake, which was supported by the state of Bavaria with large subsidies and low-interest loans. 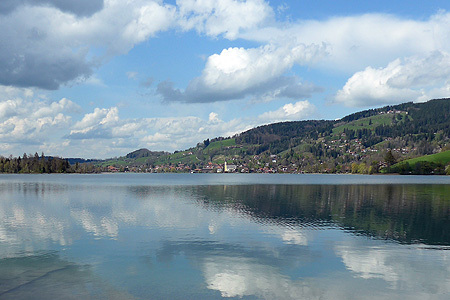 The Schliersee is approximately 55 km from Munich and can be reached via the A8 motorway from Munich to Salzburg (exit Weyarn) and Miesbach (B307).